“Sisterhood of the Traveling Pants” is a sweet friendship tale of four teenage girls, lifelong friends, who will be spending their first summer apart. On the eve of their separation, they find a pair of jeans that magically fits all of them perfectly, even though they’re all different shapes and sizes. They decide they will share the pants over the summer as a way of staying together while they are apart. I have a similar story only it involves a computer bag, someone I’d never met before and less than sweet emotions. I spied this burgundy computer bag on the second day of theInternational Diabetes Federationconference I attended this October in Montreal. Scads of people (true different sizes and shapes all) were walking around the lecture rooms and exhibition halls with this bag on their different-sized shoulders. Magically, it fit them all and I knew it would fit my shoulders as well. And I wanted one, badly. Frankly, I don’t lug around my computer. And I didn’t want this bag because I thought it was such an amazing bag, although I do love burgundy and did get married in a gorgeous cut velvet burgundy dress… but that’s another story. No, this bag had an emotional tug on me from the moment I saw it. 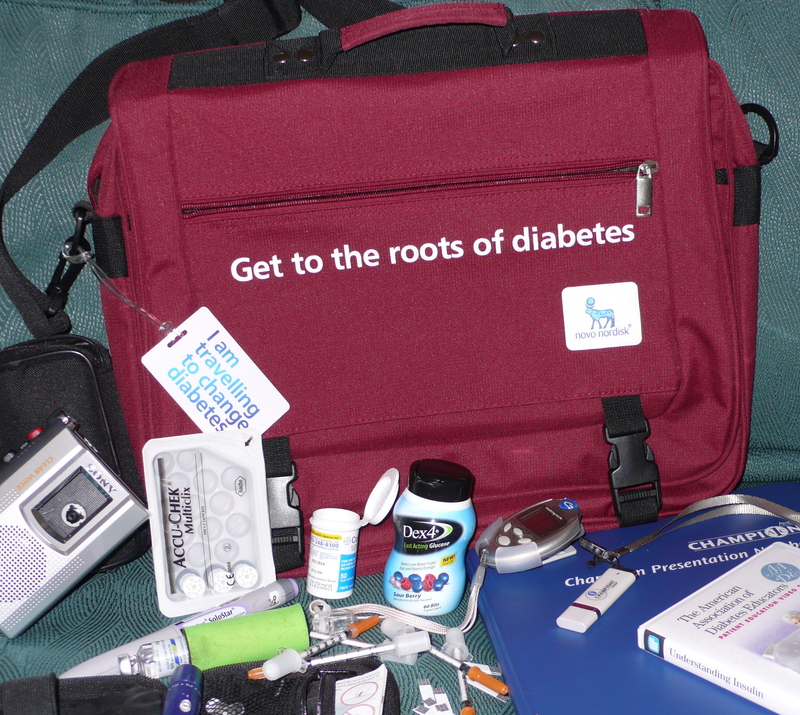 Having this bag over my shoulder would proclaim to the world just as it says, “I am traveling to change diabetes.” It would prove membership in the club of those who work in diabetes, and be validation that I am making a difference. This bag was my visible, tangible confirmation that these posts and my books and talking to fellow patients contributes something. With no congenial office to go to, no lunches with colleagues, drinks after work, boring meetings where everyone rolls their eyes in solidarity at the boss’s obtuseness, no annual Christmas party, this bag symbolized to me below my conscious radar, acknowledgement for what I do. It was a purely immature and selfish urge to want, and to get, this bag. I also noticed that the more I saw the bag around the conference, the more my amygdala (fear-based center of the brain) was controlling me beyond all reason. I asked at the Novo Nordisk booth if I could get a bag and was told they were only given to people who’d attended their seminar the first day of the conference. Disappointment clouded every other booth from my view. Miraculously, the second day of the conference I attended a small party given by one of the vendors I knew whereupon one of the guests said to me, “I know Pia at the Novo booth, give her my name and tell her I said if she has any bags left to give you one. Pia’s great, if it can happen, she’ll make it happen.” Excitement flushed my cheeks, or was it the wine? “They’re all gone?” I said dumbfounded. How is this possible? My name is in the book. I’m here as I was told to be. “Are you sure?” I almost whispered, “My name’s in the book.” “I’m sorry, they’re all gone,” she said and turned away. Without a moment’s hesitation I gave her my card and thanked her, stupidly, I’m sure I was rambling. Only as I walked away did I think the chances of her really sending me a bag from Copenhagen were slim. After all, it would be so easy to lose my card on the way home. She’d be swamped with work when she returned and this would go forgotten. Someone would have already taken that last bag from her office, or she would look at it upon her return and think it’s too much effort. But still, I waited. Hope is its own salve. I watched the mail and waited. I thought if it comes it will be in three weeks time. Certainly Pia needs some time to catch up on her work after attending this conference and it is an international package. After three weeks and no bag I kept moving my timeline out. Each day I approached my front door hesitantly, expectantly, hoping to see a package but I knew after four weeks I would never see that bag again. Just when I truly forgot about it I came back from my morning walk and my husband said, “You got a package and pointed to the FedEx box on the floor.” I looked at it and said as I sat down at my computer, “I’ll open it later.” My husband, having looked at the post mark knew what lay in the box and said, “Are you sure you don’t want to open this? It’s going to make you very happy.” Not thinking about the bag at all, it took two more of his attempts for me to get up and look at the box whereupon I saw that it was from Copenhagen. Inside was the burgundy bag and a note from Pia hoping I would enjoy the bag. Little did she know. I wrote Pia a thank you letter and sent her my books in return, yet I’m sure she still doesn’t know how much this bag and the fact that she took the time and trouble to send it to me means. The fact that there are still people in this world as good as their word. The fact that what seems like a small act of kindness can be richly rewarding to another. When I give presentations now I put my materials in this bag and on its first flight out at JFK waiting to board a plane to Cleveland, the woman sitting next to me seeing my bag smiled and asked me about what I do. Yes, it’s crazy, but I proudly sport this bag as my declaration to the world that this is the work I do. That I am a member of this club. Inwardly, it’s a cue to myself that what I do matters and that I belong right where I am. On second thought maybe this tale bears less resemblance to “Sisterhood of the Traveling Pants” and more to the film, “The Red Violin,” where a perfect violin is admired for its red color and passes through many lives playing a significant role. Maybe my bag’s adventures from Copenhagen to Brooklyn to Cleveland, where it has yet to travel, stories it will yet engender and lives it will yet touch, is the true gift and meaning of this bag.